Guardian Media profit falls sharply since 2014. A sharp fall in sale revenues in 2017, at Trinidad’s Guardian Media left the company hugging a small loss for the year ending December, according to an abridged quarterly report. Profit dropped 94 percent in the 2017, to TT$488,000, for the December quarter before tax, from $8.5 million in 2016, but rose to $1.9 million after a tax credit of $1.4 million from a net profit of just $400,000 in 2016. For the year, the media house recorded a loss of TT$3 million after tax, from a profit after tax of $6.3 million in 2016, resulting in negative earnings per share of 8 cents. Revenues fell 20.6 percent in the December 2017 quarter to TT$36 from $45 million and 16 percent to TTS$138 million from $164 million for the year. The 2017 results is in stark contrast to 2015 when the company posted $35 million after tax and TT$34 million in 2014 from revenues in excess of $195 million for both years. Cash flow brought in amounted to TT$20 million but capital payments and investments activities including paying $24 million in dividends used up $27 million, leaving cash at $72 million. Shareholders’ equity at the end of December, stood at TT$278 million, down from $305 million in 2016. Current assets ended the year at TT$131 million well ahead of current liabilities of TT$49 million. The stock last traded at TT$17.98 in November on the Trinidad and Tobago Stock Exchange (TTSE), but now has an offer at $16.38. Net asset value is TT$6.66 per stock, with the stock offered for sale at 2.46 times book value. The company is a subsidiary of Ansa McAl which is also listed on the TTSE. Trading on the Trinidad & Tobago Stock Exchange closed on Wednesday with 16 securities changing hands compared to 15 on Tuesday, with 6 advancing, 4 declining and 6 remaining unchanged. The market closed with JMMB Group continuing to rally to new 52-week highs as the price closed at $1.76 with trades of only 54 units while three securities closed at 52 weeks’ lows. 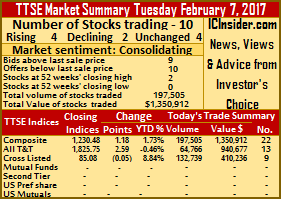 By the end of trading a total of 120,210 shares traded at a value of $4,165,527 compared to Tuesday’s trades of 649,685 valued at $4,049,106. Ansa McAL and Clico Investment led with 53 percent and 29 percent of the value of securities traded. The Composite Index added 0.48 points to 1,250.45, the All T&T Index declined by 0.24 points to 1,760.59 and the Cross Listed Index rose 0.16 points to 99.60. IC bid-offer Indicator| The Investor’s Choice bid-offer ended with 2 stocks with bids higher than last selling prices and 3 with lower offers. Gains| The last traded price of the securities rising and the volume changing hands are, Ansa McAL with gains of 4 cents, closed at $63.05 with 35,000 shares valued at $2,206,750, Ansa Merchant Bank settling at $40, in gaining 5 cents with 344 units changing hands, JMMB Group closing at a 52 weeks’ high of $1.76, after rising 3 cents with only 54 units. Point Lisas traded 19 cents higher to $4 with 5,500 shares trading, Scotiabank closed with a 1 cent gain, at $58.06 with a mere 16 units being exchanged and Trinidad & Tobago NGL closed at $23.11, after rising 1 cent with trades of 2,000 shares. Losses| The last traded prices of the securities declining and the volume changing hands are Guardian Holdings closed 11 cents lower to $15.15 with 450 units, Guardian Media hit a 52 weeks’ low of $18, having lost 34 cents trading 80 units, National Flour Mills ended at a 52 weeks’ low of $1.99, with a loss of 1 cent while exchanging 800 units and Republic Financial Holdings lost 3 cents to close at a 52 weeks’ low of $101.76 with 4,151 shares valued at $422,525 changing hands. 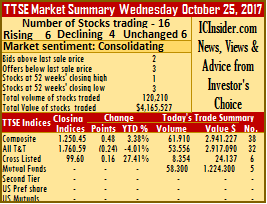 Firm Trades| The last traded prices of securities and the volume traded unchanged at the close of trading are, Agostini’s trading 1,927 units at $20.53, Clico Investment that closed at $21 with 58,300 shares valued at $1,224,300, First Citizens closing at $31.80 with 223 units. Grace Kennedy remained at $2.89 exchanging 8,300 shares, Massy Holdings closed at $49 with 3,015 shares and One Caribbean Media ended at $14 trading 50 units. Trading on the Trinidad & Tobago Stock Exchange ended on Thursday with 15 securities changing hands compared to 14 on Wednesday while the price of 1 stock advanced, 6 declined and 8 remained unchanged. 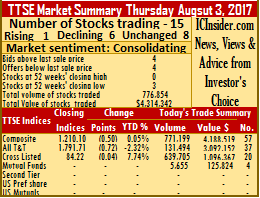 The market closed with firm with 776,854 shares traded at a value of $4,314,342 compared to Wednesday’s trades of 302,425 valued at $1,384,509. The Composite Index declined 0.50 points to 1,210.10, the All T&T Index fell 0.72 points to 1,791.71 and the Cross Listed Index lost 0.04 points to 84.22 points. IC bid-offer Indicator| The Investor’s Choice bid-offer ended with 4 stocks with bids higher than last selling prices and 3 with lower offers. Gains| Sagicor Financial gained 1 cent to close at $8.01 exchanging 20,364 shares. Losses| Ansa McAL lost 1 cent to close at $66 trading only 5 units, Guardian Media was down 1 cent to close at a 52 weeks’ low of $18.34 with 500 units changing hands, JMMB Group closed at $1.19, losing 1 cent with 447,060 shares valued at $533,595. National Flour Mills lost 2 cents to close at a 52 weeks’ low of $2.13, with 1,000 shares switching owners, Prestige Holdings closed at a 52 weeks’ low of $10.63, with a loss of 1 cent trading 305 units and Trinidad & Tobago NGL traded 20 cents lower to $23.50 in exchanging 124,297 shares valued at $2,922,069. Firm Trades| Clico Investment traded 5,655 shares at $22.25, First Citizens exchanged 3,272 shares at $31.65, Grace Kennedy closed at $2.85 trading 31,557 shares. Guardian Holdings held firm at $16.30 in exchanging 1,726 shares, Massy Holdings was unchanged at $49, with 30 units trading, National Enterprises traded 159 units at $10.48. Republic Financial Holdings closed at $101.90 trading 200 units and Scotia Investments closed at $2.20, with an exchange of 140,724 shares valued at $309,593. West Indian Tobacco traded $2,384,500, nearly 50% of the value traded on Friday. Trading on the Trinidad & Tobago Stock Exchange on Friday resulted in 10 securities changing hands, compared to 11 on Thursday. Market activity led to 2 stocks rising, 1 falling and 7 remaining unchanged. At the close, 393,123 shares were exchanged at a value of $5,048,449, compared to Thursday’s trades of 322,943 units valued at $11,771,171. The Composite Index lost 0.02 points to 1,209.85, the All T&T Index declined 0.11 points to 1,791.76 and the Cross Listed Index gained 0.01 point to 84.15. IC bid-offer Indicator| The Investor’s Choice bid-offer ended with 3 stocks with bids higher than last selling prices and 6 with lower offers. Gains| Sagicor Financial gained 1 cent to close at $8.01, with trades of 6,907 shares and Trinidad & Tobago NGL traded 9 cents higher, closing at $23.60, with an exchange of 78,579 shares valued at $1,849,738. Losses| National Enterprises closed at $10.48, losing 1 cent trading 5,000 shares. Firm Trades| Clico Investment exchanged 43 units at $22.40, First Citizens traded 2,562 shares at $31.65, Guardian Media closed at $18.35 with 53 units being exchanged,JMMB Group held firm at $1.20 with 275,000 shares valued at $330,000 trading. 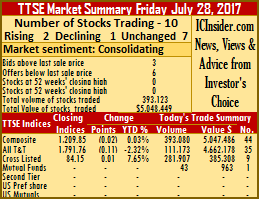 Massy Holdings closed at $49 exchanging 5,970 shares, Republic Financial Holdings traded a mere 9 units at $101.90 and West Indian Tobacco closed at $125.50, with an exchange of 19,000 shares valued at $2,384,500. 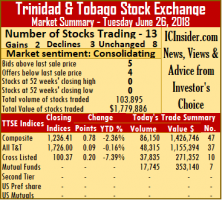 The Trinidad & Tobago Stock Exchange closed on Monday Market with a negative bias even as the all three market indices rose from a positive advance, decline ratio. Market activity resulted in 12 securities changing hands, compared to 10 on Friday. At the close a total of 4 stocks advanced, 2 declined and 6 remaining unchanged as price changes were moderate, ranging from 1 cent to a high of 5 cents. IC bid-offer Indicator| The Investor’s Choice bid-offer ended with just 2 stocks with bids higher than last selling prices and 6 with lower offers. The Composite Index advanced 0.33 points to 1,206.79, the All T&T Index gained 0.29 points to 1,790.31 and the Cross Listed Index was up 0.05 points to 83.50. At the end of trading, 103,284 shares changed hands at a value of $1,450,577 compared to Friday’s trades of 343,205 valued at $8,980,169. Gains| First Citizens gained 5 cents to close at $31.65, with an exchange of 11,597 shares valued at $367,043, Grace Kennedy closed at $2.71, rising by 1 cent while trading 30,000 shares, Sagicor Financial closed with a gain of 1 cent to $8.01 exchanging 13,987 units and Scotiabank traded 3 cents higher to close at $58.03, with 802 units switching owners. Losses| Guardian Media lost 5 cents to close at a 52 weeks’ low of $18.35, trading 19 units and JMMB Group was down 1 cent, closing at $1.25 with 813 shares changing hands. Firm Trades| Ansa McAL closed at $66, with 10,309 units valued at $680,397 trading, NCB Financial Group exchanged 30,928 shares at $4.05, Point Lisas traded 4,200 units at $3.88. Prestige Holdings remained at $10.70, with 285 units changing hands, Republic Financial Holdings closed at $101.90, with 119 shares being exchanged and Trinidad & Tobago NGL held firm at $21.90 trading 225 units. Prices on the Trinidad & Tobago Stock Exchange closed firmer on Friday than for some time now with the number of stocks having bids higher than the last selling overwhelming those with lower offers. Trading closed with 13 securities changing hands compared to 12 on Thursday, resulting in 5 stocks advancing, 3 declining and 5 holding firm. Traded volume ended with 296,692 shares exchanged valued at $2,461,941 compared to Thursday’s 159,618 shares valued at $7,100,011. The Composite Index advanced 0.37 points to 1,222.16, the All T&T Index gained 0.17 points to 1,799.30 and the Cross Listed Index gained 0.08 points to close at 86.50. IC bid-offer Indicator| The Investor’s Choice bid-offer ended with 8 stocks with bids higher than last selling prices and 2 with lower offers. Gains| First Citizens gained 10 cents to close at $32 exchanging 100 shares, Guardian Holdings added 5 cents, closing at $15.65, with trades of 35,423 shares valued at $554,370, JMMB Group closed at $1.27, with a 1 cent gain trading 88,412 shares, Point Lisas gained 1 cent to close at a 52 weeks’ high of $3.88 exchanging 10,000 shares and Sagicor Financial closed at $9.08, gaining 3 cents with 10,000 shares changing hands. 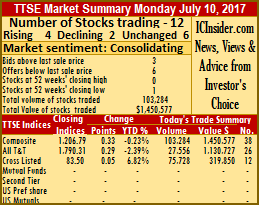 Losses| Guardian Media traded 25 cents lower to close at a 52 weeks’ low of $18.40, exchanging 348 shares, NCB Financial Group lost 1 cent to close at $3.99 with trades of 100,000 shares valued at $399,000 and Trinidad & Tobago NGL closed at $22, losing 30 cents with 2,000 shares changing hands. Firm Trades| Clico Investment traded 38,093 shares at $22.51 valued at $857,413, National Enterprises closed at $10.53 exchanging 9,000 shares and National Flour Mills closed at $2.48 with trades of 350 shares. Scotia Investments exchanged 925 shares at $2.70 and West Indian Tobacco traded 2,041 shares at $126.49. Witco had the largest trade on the TTSE on Friday. West India Tobacco, Trinidad & Tobago Stock Exchange’s dominant trade on Friday, closed with just over 47,700 units. The cigarette producer, accounted for nearly half of the total volume passing through the market, in a lacklustre trading session, that saw all market indices falling moderately. The market closed with 12 active securities compared to 18 on Thursday with 1 stock advancing, 5 declining and 6 holding firm. A total of 104,081 shares changed hands at a value of $6,914,298 compared to Thursday’s 610,096 shares valued at $3,541,855. The Composite Index lost 0.91 points to 1,242.08, the All T&T Index fell 1.37 points to 1,827.95 and the Cross Listed Index was down 0.06 points to 87.99. IC bid-offer Indicator|The Investor’s Choice bid-offer ended with 6 stocks with bids higher than last selling prices and 8 with lower offers. Gains| Scotiabank closed at $59.01 with a 1 cent gain trading 226 shares. Losses| Clico Investment traded at $22.50, losing 1 cent with 11,701 units changing hands, Guardian Holdings closed at $16, with a loss of 5 cents exchanging 17,669 shares, NCB Financial Group lost 2 cents with trades of 1,717 shares to close at $3.78, while Trinidad Cement was down 3 cents, closing at $4.17 with an exchange of 4,769 units and Trinidad & Tobago NGL closed 79 cents lower to $22.71 trading 3,362 shares. Firm Trades| Angostura Holdings traded 1,000 units at $15.01, Guardian Media closed at $18.65 trading 3,224 units, JMMB Group held firm at $1.22 with 1,000 units changing owners, One Caribbean Media closed at $16.48 with an exchange of 1,505 shares. Sagicor Financial remained at $9.01 trading 10,200 units and West Indian Tobacco was unchanged at $127 trading 47,708 shares valued at $6,058,916. 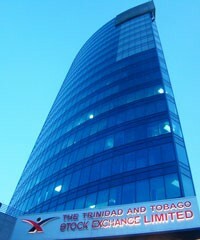 Trading on the Trinidad & Tobago Stock Exchange on Friday saw 11 securities changing hands compared to 16 on Thursday. Unilever Caribbean reaped a $1.25 gain to rise to $58.25 trading 4,260 units. 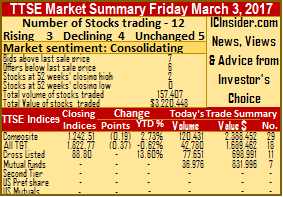 The market closed with 3 stocks advancing, 5 unchanged and 3 declining as 157,407 shares were exchanged at a value of $3,220,448 compared to Thursday’s 337,591 shares valued at $2,989,250. The Composite Index lost 0.19 points to 1,242.51, the All T&T Index dropped 0.37 points to 1,822.77 and the Cross Listed Index remained at 88.80 points. IC bid-offer Indicator|The Investor’s Choice bid-offer ended with 4 stocks with bids higher than last selling prices and 6 with lower offers. Gains| Clico Investments added 1 cent, closing at $22.51 trading 36,976 shares valued at $831,996, L.J. Williams B gained 5 cents to close at a 52 weeks’ high of 80 cents with 10,000 units changing hands. Losses| First Caribbean International Bank lost 1 cent to close at $9.15, with trades of 17,062 units, Grace Kennedy fell 1 cent to $2.63 trading 300 shares and Trinidad & Tobago NGL closed at $22.65, losing 35 cents with an exchange of 1,000 units. Firm Trades| First Citizens Bank closed at $32.25 trading 2,353 units, Massy Holdings traded 25,000 shares at $53 valued at $1,325,092 and National Commercial Bank was unchanged at $3.70 with only 128 units traded. Sagicor Financial traded 60,161 shares with a value of $541,449 at $9 and Scotiabank closed at $58.75 trading 167 shares. The Trinidad & Tobago Stock Exchange closed on Tuesday with 10 securities trading compared to 14 on Monday with more stocks rising in price than those declining. 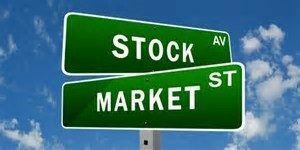 At the close, 4 stocks advanced, 2 declined and 4 were unchanged, resulting in 197,505 shares changing hands at a value of $1,350,912 compared to Monday’s 985,557 shares valued at $2,465,660. The Composite Index gained 1.18 points to 1,230.48, the All T&T Index advanced 2.59 points to 1,825.75 and the Cross Listed Index lost 0.05 points to 85.08. IC bid-offer Indicator|The Investor’s Choice bid-offer ended with 9 stocks with bids higher than last selling prices and 10 with lower offers. Gains| Ansa McAL gained 61 cents to close at $66.45 with an exchange of just 25 units, Guardian Holdings added 6 cents and closed at a 52 weeks’ high of $14.61 with 52,069 shares changing hands at a value of $759,849. Trinidad & Tobago NGL closed at $22.55, gaining 5 cents with 5,056 shares traded and Guardian Media 6% preference share added 3 cents to close at a 52 weeks’ high of $65.04 with a mere 5 units switching owners. 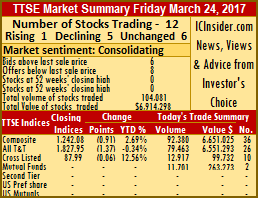 Losses| Sagicor Financial dropped 8 cents, closing at $9.12 with 10,094 units being exchanged and Scotiabank lost 5 cents to close at $58.70 with 274 shares changing hands. 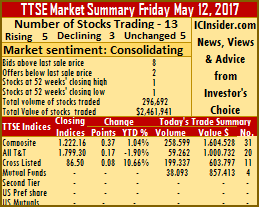 Firm Trades| Grace Kennedy closed at $2.65 trading 107,120 units, Scotia Investments remained at $2.21 with an exchange of 15,525 shares, Trinidad Cement held firm at $4.15 with trades of 7,000 shares and Unilever Caribbean closed at $58.50 with 337 units changing hands.